You may have heard the expression that “cleanliness is next to Godliness” and without a doubt this would not be a beloved mantra by most. Yesterday just so happened to be my opportunity to catch up on all the neglected household chores of the week. From the kitchen to the bathrooms, floors and counter tops, laundry and mealtime preparation it all lay before me demanding my diligent attention. Were there other things that I would have preferred to be doing on my day off? Most certainly, and make no mistake many of these diversions occupied space in my thoughts as I moved from room to room. Yet, despite these thoughts, God was also calling me to see his presence both in the work at hand and introspectively in making ready for the season. Thus, advent, it seems to me, is a time of preparation of heart and home for the celebration that is to come. For, in a mere matter of weeks we are to rejoice in the birth of our savior and more than an calendar observation it requires our active participation. If we are to make a home, a resting place for the Christ child, and a welcome for the visitors who come to see Christ within us what do we need to do this advent? First, we need to prioritize. Recognizing, that as conflicts arise that we need to put God first. While Christmas shopping, parties, concerts and plays are all enjoyable albeit unavoidable excursions, we cannot forget to make time and space in our days for God. If necessary, put this appointment with God on your calendar. For many, if it is on the calendar it is more likely to be a reality. Then research the availability of local churches for adoration time, healing Masses, and reconciliation that will work the best. What spiritual housekeeping have I been neglecting lately? 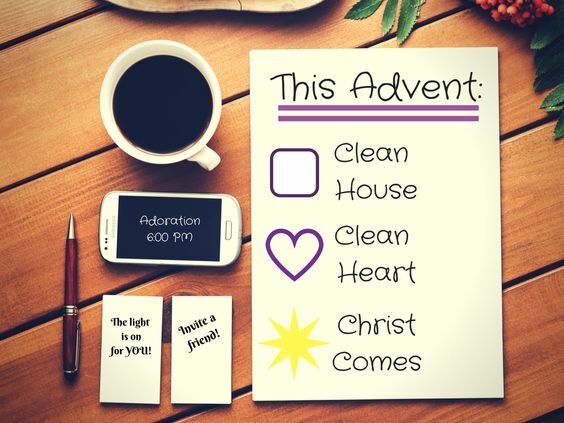 Have I made time to clean the corners of my heart and prepare a place for Christ this Advent? Next postWorth Revisiting: Be a Witness!